Abstract: Objective To investigate the relationship between stress and social anxiety of medical students in military universities, and to explore the related mechanisms. Methods Two hundred and eleven military medical university students were tested by interaction anxiousness scale (IAS), stress scale for college students (SSCS) and Connor-Davidson resilience scale (CD-RISC). 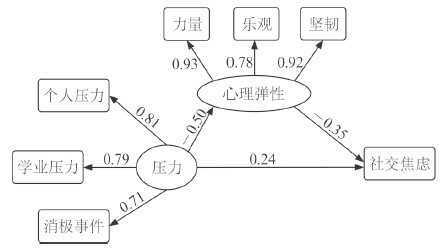 The Pearson correlation analysis and structural equation model were used to analyze the relationship between the variables. Results A total of 198 valid questionnaires were collected, with the effective rate being 93.8%. There were significant correlations between social anxiety and various dimensions of stress and resilience (all P < 0.01). Structural equation model showed that the resilience partially mediated the relationship between stress and social anxiety (χ2/df=2.08, P < 0.05; root mean square error of approximation=0.074, comparative fit index=0.98, normed fit index=0.97, incremental fit index=0.98). The total stress score of the male students was greater than that of the female students in military medical universities (24.67±15.01 vs 20.17±13.07, t=2.17, P < 0.05). Conclusion Resilience has partial mediating effect on the relationship between stress and social anxiety. Therefore daily management of military medical university students should be emphasized on the cultivation of resilience. 美国精神医学学会.精神障碍诊断与统计手册[M]. 5版.张道龙, 等译.北京: 北京大学出版社, 2016: 101-102. FARMER A S. Daily stress reactivity in social anxiety disorder: a temporal process approach[D]. Fairfax, VA: George Mason University, 2014. 张水淼, 李新利, 崔轶, 蔡文鹏, 邓光辉. 领悟社会支持和海军官兵急性应激反应的关系:心理弹性的中介效应[J]. 第二军医大学学报, 2017, 38: 234-238. ZHANG S M, LI X L, CUI Y, CAI W P, DENG G H. Relationship between perceived social support and acute stress reaction of naval soldiers:mediating effect of resilience[J]. Acad J Sec Mil Med Univ, 2017, 38: 234-238. 张红坡. 大学生生活事件对应对方式的影响:心理弹性的中介作用[J]. 中国健康心理学杂志, 2015, 23: 1582-1585. 张帆, 王明怡, 陈英和. 呼和浩特市高一年级学生对学业不良学生刻板印象研究[J]. 中国学校卫生, 2016, 37: 867-869. 张姗姗, 宋利. 大学生心理弹性与社交焦虑的关系研究[J]. 安徽理工大学学报(社会科学版), 2016, 18: 70-74. 朱振华, 张银玲, 王静. 军校学员人际关系状况的调查报告[J]. 中国健康心理学杂志, 2016, 24: 1318-1320. 缪胜龙. 国内关于心理弹性研究取向的综述[J]. 社会心理科学, 2012, 27: 23-27. 李玉蓉, 赵丰. 医学生压力状况及其影响因素[J]. 中国健康心理学杂志, 2012, 20: 1881-1883.